Contact Juli & John with questions, stories or technical glitches. Please, no solicitation. Kitka has evolved into a place where we blog about our personal experiences and our shop only. Thus we feel that the voice and content needs to be uniquely our own. If you are looking for our shop, mjölk, visit our website here. We are located in The Junction neighborhood of Toronto, at 2959 Dundas Street West. Email the shop at info [at] mjolk [dot] ca or call us at 416-551-9853. See you soon! Subscribe to comments with RSS or TrackBack to 'Contact'. Hello! I am trying to track down String shelving to purchase for our office. I noticed in one of your posts from 2010 you ordered some for your store. Do you still carry it, or can you order it? I was thinking a combination of open and closed shelving, for an approximate 56″x32″ unit. If you do not carry it, do you know of any companies that do? Thank you!! Hi Leticia, We don’t carry String anymore. Please visit string.se! I was wondering if you are willing to accept paid/sponsored post on your Blog. Can you please let me know with the rate you charged for per post? Looking for your kind reply. I love the concept of importing furniture and selling it in Canada. It has always been a dream of mine. Just wondering, what made you get into this business? Would you ever consider posting a blog entry about your journey thus far? Hi John, thanks for your inquiry! Not a bad idea to tell our story here on the blog. Sometimes it’s a challenge to articulate. The short version is that John was interested in furniture, and we found that what was available locally was not our style. We felt like there was a hole in the market and this was in part our motivation. That said, importing furniture is not for the faint of heart! Challenges with shipping, damages, timelines, duty, brokerage and other costs arise. The role of the small retailer is not as respected these days due to the customer expectations that have been created thanks to big box corporations. I am happy to report though, in the last 6 years we’ve been in business attitudes are shifting, and I am hopeful that people will tire of the mass consumer culture and learn to cultivate a more personal experience. Hi Sufyan, thanks for your interest in advertising on our blog. At this time we don’t do advertising, partially because it’s a personal blog, partially because the blog is an extension of our shop. Do you still have hudsalva in the store? Hi Margit, Sorry we are out of stock of the Hudsalva…we’ll be reordering soon. Looking to see if you have the sheep rocking horse or where I can get it? No, we are no longer able to carry the rocking sheep, and I am not sure who may sell them now. Look up Povl Kjer…maybe a Danish shop has it. Best wishes! Hi – I’m planning to whitewash our pine floors and came across your blog. We tried the sample of bleaching twice (which I like) but now read that bleachingmay not work with pine floors but lye soap may . ,- canbyou pls provide me with how you did it? Ingredients? Thanks! Hi Soobin, we used products made by WOCA – they sell a lye treatment and pre-made soap for cleaning, among other fantastic products. I highly recommend their products. Hi Sylvia, as far as I know it was a one time thing. Sorry to disappoint. Hi, i wondered what type of plywood you used for the floors in your shop? do they hold up well or require much maintenance? Thanks. It’s held up pretty well considering the increase in foot traffic over 8 years. 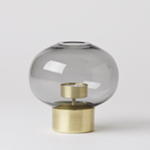 Uki candle holder in brass and grey Murano glass Back in stock!